A comparison between a normal and a wet carcass syndrome carcass (adipose tissue can be pulled away from the carcass). Wet carcass syndrome (WCS) is a condition found in sheep, which negatively affects the quality of the carcass. Prior to slaughter, the animal appears physically normal, showing no symptoms of any abnormal condition. However, after removal of the skin during the slaughter process, affected animals show an accumulation of watery fluid on the dorsal (upper) parts of the carcass as well as on the hind legs and flanks. The carcass appears ‘wet’ and does not dry off after overnight cooling. Affected carcasses have a reduced shelf life and are aesthetically unacceptable to the consumer. The most sensible explanation for the reduced shelf life is that the surface of the meat offers a favourable environment for microorganism growth. Wet carcasses also pose a risk to the butcher who uses a band saw. Carcasses that show WCS characteristics are generally rejected at the abattoir as unfit for human consumption. WCS is seen mainly in Dorper sheep and Dorper crosses. The Dorper breed is greatest in numbers in the geographic regions where WCS occurs most frequently, which is in parts of the Northern Cape Province in South Africa and the southern areas of Namibia (Kalahari dunes and sandy veld). Unofficial slaughter statistics from WCS affected areas reveal that certain abattoirs have higher numbers of WCS carcasses while other abattoirs in the same region have recorded very few or no incidences of WCS. 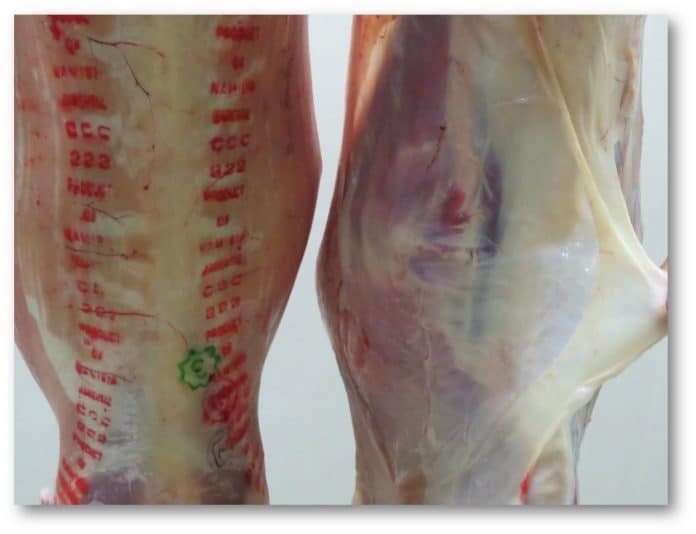 Lamb and mutton producers are extremely concerned about this condition, not least because of the financial losses it incurs, which may rise to more than R27 million in some years. The slimy, wet look typical of a wet carcass. Despite long-standing knowledge of the condition, little more is known about WCS and its causes than when it was discovered and investigated in the early 1980s. It has proven impossible to induce the condition and there are years when it is virtually absent. Over-hydration of thirsty sheep on arrival at abattoirs, transport distances to abattoirs, allergies, compulsory dip, washing of carcasses in abattoirs under high pressure, condensation in coolers and provision of feed blocks during the pre-slaughter phase have been investigated as possible factors causing WCS. However, research could find no conclusive link between these factors and the occurrence of WCS. When evaluating the results of prior research, no physiological, environmental or management system effect, could be conclusively identified as the causative agent of WCS. However, stress experienced by the animals during the pre-slaughter period has been proposed as a possible contributing factor. Some prevention strategies have been proposed, but the condition of WCS still appears from time to time and is more severe in some years. The fact that a) it has not been possible to induce WCS experimentally, (b) it occurs sporadically, (c) not all members of the same group are affected, (d) there is purported breed specificity, and (e) there is a known genetic basis for somewhat similar conditions in other species, all suggest variation in the degree of susceptibility. ARC-Animal Production, in collaboration with the University of the Free State, has embarked on a genome-wide association study to discern any underlying genetic predisposition to this syndrome and to identify possible candidate genes that can be used in selection to reduce the incidence of WCS. Possible candidate genes for WCS were identified in the literature. These candidate genes were the ‘genetic foundation’ of animals that produce meat with the characteristics of being pale, soft and exudative- (PSE); red, soft and exudative- (RSE) and dark, firm and dry (DFD) meat. These conditions are primarily observed in pork and poultry meat, but show phenotypic (visual) characteristics that are similar to WCS. All three of these meat characteristics are ‘triggered’ by stress. From a genetic perspective, PSE and RSE are caused by mutations within genes. Muscle samples from 43 affected and 41 unaffected carcasses were collected. The final data used consisted of samples from 38 male animals (19 affected and 19 unaffected) and 31 female animals (14 affected and 17 unaffected). By using a candidate gene approach it was possible to map the genetic loci associated with porcine stress syndrome and red, soft and exudative meat to the ovine genome. The positions of these loci, mapped to the ovine genome, were not in accordance with the loci showing significant association with the WCS phenotype; and no relationship was found between single nucleotide polymorphisms (SNPs) located within these genes and WCS. Furthermore, no association between the phenotype (WCS) and any autosomal genetic marker(s) i.e. SNPs, could be found. The carcass is soft and the meat gives easily under finger pressure. The study did however provide strong positive results in that at least two DNA markers positioned on the X chromosome of the affected male animals are most likely associated with WCS. These two identified DNA markers were then further linked to two possible genes that were identified as candidate genes for WSC. Results from female animals were ambiguous. Recalling that male sheep have one X chromosome while females have two; one possible explanation for this difference between males and females could be the phenomenon of random inactivation of one of the X-chromosomes in each of the somatic cells of females, resulting in the likely co-expression of heterozygous genotypes because of random X-inactivation results on a mixture of cells in different tissues. Any role that variation in pre-slaughter stress may have in manifestation of WCS further clouds the issue because these DNA markers were also found in the genotypes of some animals with unaffected or normal carcasses. The number of animals used in the current study would have been adequate, based on the original hypothesis that the genetic basis for WCS was caused by a simple autosomal recessive allele. Since we now know that this is probably not the case, and that the mechanism seems to be more complex, involving the X chromosome, there is a need for more samples. The current level of significance, using the Chi-Square (χ2) test of dependence, is P<0.05. Future studies should continue the progression toward the ultimate development of a genetic test that can be made commercially available to identify carrier or genetically predisposed animals to WCS which will assist in reducing the prevalence of WCS. Steps in this process may include: dissecting the breed composition of the affected and unaffected sheep; attempting to trace affected animals back to the farms of origin; trying to identify dysregulated genes that affect fluid excretion; conducting a chemical analysis of the fluid build-up in/on the carcass; quantifying differences in stress experienced by affected and unaffected sheep, and ultimately sequencing the X chromosome of both affected and unaffected males in order to identify the position of the causal variant for WCS. However, farmers need an immediate solution, even if it is not full proof. There are indications (although unproven) that post slaughter the calcium ion homeostasis may be disrupted, since the calcium channels of the cells remain open in affected sheep, as a result of stress. Following a meeting between the ARC, Northern Cape RPO, KLK abattoir, farmers and a private veterinarian recommendations for possible preventative measures are being developed. – Michiel Scholtz, Lené van der Westhuizen, Mike MacNeil and Frikkie Neser.